Are you feeling festive? Or do you need some inspiration to get into the holiday spirit? 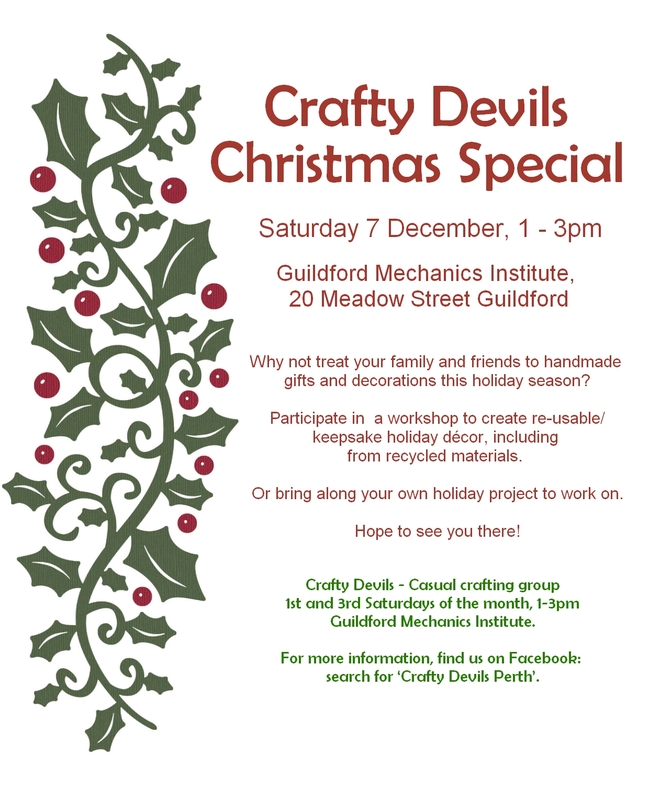 Then wander down to the Crafty Devils Christmas Special on Saturday, December 7 from 1 to 3 p.m. at the Guildford Mechanics Hall to join in the fun. Even if the mainstream “silly season” traditions aren’t your style, there is certainly opportunity to learn new ways of promoting low-impact gift giving (for any time of year), unique “upcycled” craft or present ideas, and just a lovely chance to meet and chat with some other local creative people. Men and women of all ages and creative disciplines are welcome, but please leave the babies/kids/pets at home. (bring your friends & neighbours too!) There will be a festive holiday tea, and if anyone would like to contribute their own trademark treat that would also be lovely. This entry was posted in Arts & Crafts, Event and tagged community, crafts, Crafty Devils, creative, holiday, sustainability, upcycled. Bookmark the permalink. Id love to see a community event that is pro family on here- I wasn’t planning on bringing kids but when it says not to bring them I suddenly feel unwelcome. I know of a few friends in other cities who craft with babies around? Apologies for putting you off. It was not intended to be unwelcoming, just a safety issue, with hot irons, multiple sewing machines and power cords everywhere…. FYI, the Crafty Devils are heading off on their own in 2014 and will probably be meeting at peoples homes, check out their facebook page for details.